Richard J. Greenstone practices copyright, trademark, licensing, and transactional law for the computer, entertainment, and publishing industries in San Francisco representing media entertainment companies, domain name owners, software, book and magazine publishers, programmers, authors, actors, artists, and producers throughout California, the United States, and the world. 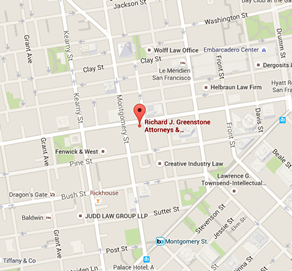 Richard Greenstone has over thirty four years of legal experience in these industries and substantive law areas. Richard Greenstone is a member of the California state bar, admitted to several United States District Courts, and is an elected member of the Los Angeles Copyright Society. Richard Greenstone practices before the United States Copyright Office and the United States Patent and Trademark Office in trademark matters. He has well over five hundred trademark applications and registrations to his credit performed for both clients and other attorneys who seek his advice. Richard's trademark practice includes branding, registration, infringements, and trademark portfolio management. Richard Greenstone has an active entertainment law practice representing producers, directors, actors, authors, and musicians in the motion picture, television and music industries. His most current project involved clearance of all music rights for the album Welcome to the Folksong Café. Richard Greenstone actively participates in the American Bar Association. He currently produces the program Young Lawyer and Law Student Orientation: Your Questions Answered for the American Bar Association's Forum on the Entertainment and Sports Industries. Richard served on the governing committee of the Forum and was also Division Chair for the Visual Arts Division, Publications Chair, and editor-in-chief of the Forum's law journal Entertainment and Sports Lawyer. Richard Greenstone also served as Forum liaison to the American Bar Association's Technology Counsel and was a member of the Standing Committee on Strategic Communications. 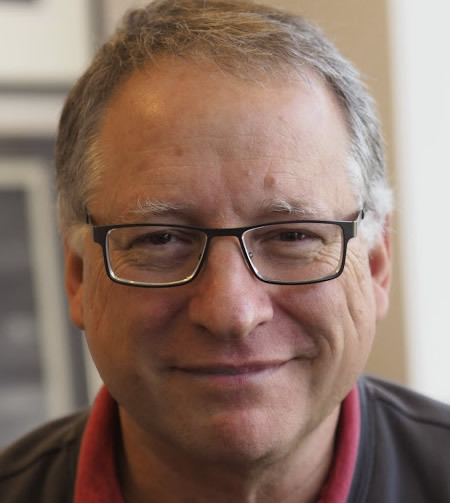 Richard Greenstone has authored over twenty articles on copyright, trademark, computer, entertainment, and licensing law, and has authored software on copyright law (17 U.S.C. § 101 et seq.) and the sale of fine prints (California Civil Code §§ 1740 - 1745.5). Richard Greenstone served on the advisory board and wrote a monthly column for Aspen Law and Business' magazine The Licensing Journal. Richard Greenstone also publishes Law Bytes. Currently in Law Bytes is an article by Dan Haggarty and edited by Richard Greenstone on human authorship in copyright law. Richard Greenstone is an avid photographer; his pictures appear on this website. In the past three years Richard displayed his work in three shows at Zindagi and McGuire galleries in San Francisco and Collector Gallery in Berkeley. You can see some of the pictures from these shows on his Facebook website Reflected Eye. While all of Richard Greenstone's photographs are original and created with great care, what you will not see on this website are stock photographs of models—like on large law firm web sites—acting as if they were attorneys. Our firm is the real thing with real vision and real legal experience and no stock photos!